Alejandra is a native from the mountains of Chile, and offers nine years of experience in the equine based learning field. 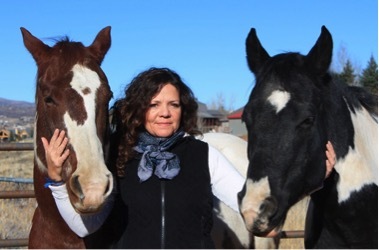 She is the founder, facilitator and coordinator of the Equine Assisted Learning program at National Ability Center in Park City Utah, primarily offering military programs. Alejandra is EAGALA (The Equine Assisted Growth and Learning Association) Certified with a distinction in Military Services. In addition she has received certificates through the Professional Association of Therapeutic Horsemanship International (PATH Intl. ), the Equine Specialist in Mental Health and Learning ESMHL, and EFLC through The Academy for Coaching with Horses. As a Navy Mom, Alejandra is passionate in facilitating growth and healing in partnership with horses. Alejandra has presented at the : 2016 Horse Healing Collective in Dallas, Kathy Pike Conference & Retreat, No Barriers Summit, PATH Regional Conferences, Adapt to Achieve Conferences, and at the University of Utah College of Social Work and conduct international trainings preparing team in the equine learning field. Alejandra is a lifelong horse-woman, and during her free time she enjoys riding in the backcountry of Utah with her partner Jeff. Check her out at: www.alejandralara.net!